I was in a car with my friend, driving to Ottawa when the debate started. We were talking about the education system in Bangladesh when the University of Dhaka (DU) came up into the conversation. 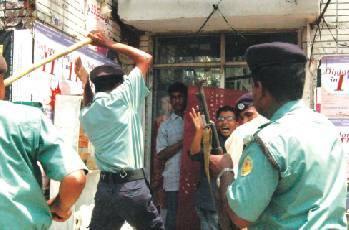 "Dhaka University te ki chele pathabe morte?" I stared at her incredulously and exploded. She was the last person I would have expected to have insulted my beloved university. After all not only were her parents and my mother alumnae of it, but my mother was also a teacher there. Yet now as I think back, I keep on sifting through that conversation in my mind. No I don't agree at all with what she said because if it were true, my mother, God forbid would be dead by now. But the conversation keeps coming back to me in light of recent events. Shammi Akter Happy's death, and the events that followed the tragedy are on the cover of dailies everyday. When my mother called me up on Saturday to give me the news, I felt the same remorse I had felt countless times before when I had heard someone had been killed in a road accident. As jaded as this may sound, it no longer surprised me because given the current condition of our road and transportation laws, these so called "accidents" were bound to happen. What did surprise me was the chain of events that followed the tragedy. Someone died in a road accident. That someone just happened to be a DU student. Poor soul didn't even die inside the campus. The death wasn't even caused by a political riot. Then why exactly are the student wings of our two leading parties at each other's throat? 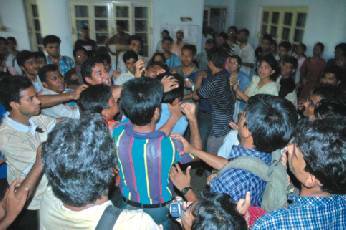 Why did DU students have a ransacking party in Nilkhet right after the accident? And most disturbingly why have the DU exams been halted? We all know the answer. Student politics. There I said it. Don't worry, I'm not going go on and on about what our student "politicians" are doing. The dailies are keeping their end of the bargain and filling you in on that. But I will say one thing- this so called politics is ruining what used to be one of best educational institutions down this end of Asia. For all those people who are pro-student politics and probably thinking I don't know anything about student politics, you couldn't be more wrong. Having run for a student government post at my own university, I'm quite aware of the whole concept of student government. Unfortunately it's more than debatable whether the American or rather global concept of student politics tallies with that in Bangladesh. After all when I was running for government, I didn't claim I was a Democrat or Republican, I along with my campaigners didn't get into fist fights with the opponent and I certainly didn't go around threatening people for their vote. The whole concept of student government came about because the student body needed somebody to represent them, be their voice and fight for their rights. It's about fighting for lower tuition and more housing and better meal plans among other things. It's not about reigning terror, affiliating oneself with a political party and taking advantage of the force provided by affiliated politicians to have one's own way. And yet that's exactly what Chatro League and Chatro Dol are doing. The victims? 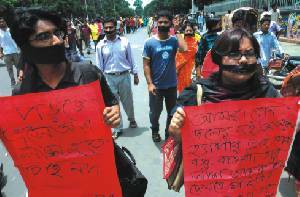 Students, teachers and above all the University of Dhaka itself. Where once it was a pride for parents to say their kids studied at DU, now parents think twice before even letting their kids take the admission test. The amazing thing is that while DU students express unleashed fury with the drop of a hat, yet in the face of their biggest problem, their crippling student politicians, they barely voice any protest. There are probably a thousand students in DU who are student politicians. Ceterus paribus, lets just say every single non-affiliated DU student protested against these one thousand viruses? Would they stand a chance? You decide. But why aren't they standing up for their rights? That's one question that even beats me. Getting back to how it all started. One accident. Riots, injuries, exams cancelled, sessions jammed. Is it all worth it? You decide. The room was unnaturally dark and unusually for a room of its kind: quite empty. On a table in one corner stood an unassuming trough of water and beside it a test tube containing a pinch of sinister liquid. It was of a pale blue color and looked cold, as if made of serious matter that did not permit any futile business around it. There was nothing in the room that gave away the fact that a mystery was about to unraveled just at that moment, until a man walked in. He approached the table calmly but his hands were just beginning to shake. He then proceeded to disobey every rule of a laboratory and did what any school boy wanted to do in his first chemistry lesson: he took the test tube and poured its contents into the trough of water. Robert van Daan had a fraction of a second to shield his eyes with his hands from the unstoppable glare his actions had produced. A hissing sound told him the reaction was complete and he opened his eyes to a fire that danced proudly on the surface of the water. In an eruption of excitement, he clasped his hands in glee, as euphoria swept through his body. Still shaking he knelt down and admired the fire: its cracks and lobes, the different shapes it was assuming, as the water slowly turned a deep shade of purple. At last, he had brought back to the world what was thought to have become extinct. Reincarnated from the graves from Byzantine, the Greek Fire was a mystery no more; the clever Byzantinians had tried their best to take their ingenious secret with them to the next life. Robert van Daan was a step ahead of them. Ever since an ancient painting had been uncovered from a ruin near Istanbul, Robert had been obsessed with its subject a mysterious 'fire from hell' that burned on water and was used by the Byzantinians to protect Constantinople, their capital. Even the most formidable ships could not survive this fire but as the Byzantinians civilization crumbled the formula for this substance had vanished. Now, nearly a thousand years later, after seven years of research, explosions, bankruptcy and near insanity, he, Robert van Daan had brought the Greek Fire back. At last, his mind at rest, his thirst quenched, he watched his discovery in awe, like a wizard in front of his cauldron. The toxic fumes from the fire penetrated his body and he felt dizzy. He could feel the fire taking him away from his body but he had lost all powers to resist. Instead he left willingly to wherever his fire was taking him. Gradually the fire died down after a short uneventful life, lost once more from the hands of man but having taken its creator to the next life.